Douglas Miles –– "Heavy Influence"
“These Native American artist rooms offer our guests a very unique experience unlike anything else in New Mexico,” said Heritage Hotels and Resorts, Inc. CEO, Jim Long. 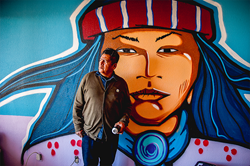 Many of the participating Native American contemporary artists are students or alumni of the Institute of American Indian Arts and are also are Southwestern Association for Indian Arts and show work at Santa Fe’s Indian Market. All of the artists have ties with New Mexico and several have received national recognition and awards. An exciting opportunity for the public to preview all 36 guest room installations will occur on the evening of May 17, 2018 at a reception with all many of the participating artists. Nativo Lodge will be hosting a special media introduction at 4:00pm, with doors opening for public access at 5:00pm MST. The artists will have original artwork for sale and the reception will feature Native American DJs and signature cocktail drinks. Heavy Influence: In New Mexico the influence of Native American people is felt and seen on almost all aspects of the community. I painted Indian faces gracing walls to commemorate contributions by the original citizen occupants of New Mexico. Weaving Wonderland: My grandmother and aunt are known weavers, who are still practicing the intricate traditional skill. The Tree of Life represents all life on earth and the harmony that exists between them. Across the Universe: The room exemplifies traditional subjects with Kawaii art (Japanese meaning for cute) to suggest that traditional knowledge continues into the present. Beauty Is In Her: Beauty is a way of protection for me. As children we are told to practice the true nature of beauty before us, behind us, above us and below us. It is in the Navajo Culture that we share the verse, “Walk in Beauty”. Rest and Rise: This room was created in honor of the sacred feminine. Zitkála-Šá was an artist and political activist Sioux woman who lived 1876-1938. She made it her life to fight for civil rights, health care, and education for Native Americans. Together…Stargazing…: We need to be to be loving to ourselves, our mates, our children, our elders, and our friends. We need to make good choices and failures, they’re hard on the heart. Be brave and be strong in your effort to make good choices. Rise: This room is showing recognition to women rising and our future generation. Joann Kauffman and Kim Smith are Native rights activists. Harmony of Cycles: The cyclic motion of our Universe decorates the interior of this room just as it does with the surrounding environments of this ever-changing land. Where the Fire Is Born: The designs and symbols in this room commemorate the Araro Jóskua, the place where the P’urhepecha fire surges. It’s a space that evokes and honors the inner light and ancestral memory. A Fourth World Life: This space embodies Diné traditions of storytelling particularly in the creation story and epistemological beliefs, incorporating three fundamental elements of the land/earth, rainbows, and several motifs of Navajo storytelling. If You Believe: This room depicts popular culture icons intertwined with traditional Puebloan interpretations of design which influences and teaches the viewer about what Pueblo people believe in. Indigenous Time: This room incorporates Sacred Calendar systems and Sacred Geometry. Spiderwoman is at the threshold outreaching to the Universe and casts a web of time.